This week has been a exciting week for year 3, on Monday, Y3 caught the train into the city centre to visit Birmingham Museum and Art Gallery to learn more about our topic ‘Gods and Mortals’. This topic is based around the Ancient Greeks and Y3 will be finding out more across this half term. At the museum we explored the Ancient Greek gallery, sketched and designed an amphora pot with a geometric design. This design was created by looking at the different pots and recreating it by sketching and adding the fine detail. 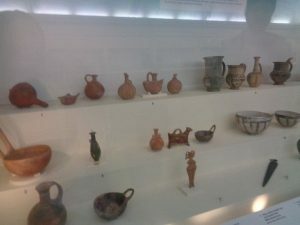 Also in the gallery we carried out a treasure hunt, where we found the Ancient Greek equivalents of everyday objects, e.g. a jug or mug. Year 3 also found out more about each of the different gods and designed an offering for them. 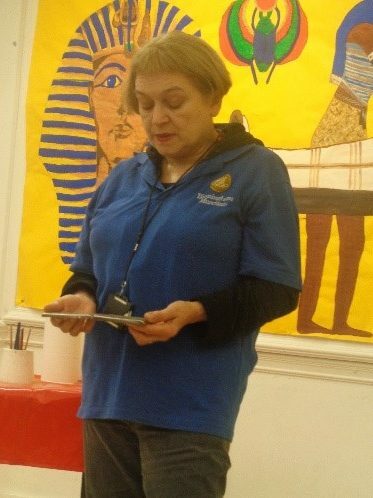 Finally we worked with Anna, the museum lady and handled different artefacts looking at what they were and what they are used for. 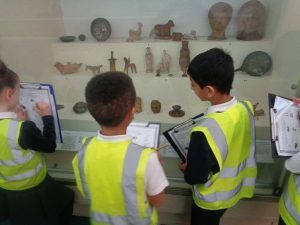 This was exciting for year 3 because they were given the opportunity to create a condition report explaining what the condition of each artefact is like. 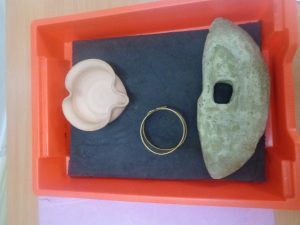 They were also given the opportunity to clean some of the artifacts using a cotton bud and working collaboratively to get it cleaned.